Note: This makes at least the sixth time in 17 years the LC has studied this famous passage–just over once in every three years. What makes this repeated study particularly interesting is witnessing in a snapshot expression my evolving application–as a maturing parent, and not just to my natural-born kids, but to all my kids, over the past 17 years– of this passage’s powerful truth. Truth in time. Read, witness and learn from both my mistakes and perseverance. Last week, in our study of the angel Gabriel’s announcement to the priest Zacharias that his elderly life, Elizabeth would have a child, whom they were to name John and who would prepare the nation for this coming of their LORD, three things leaped up out of the text at me: 1) the work, time, inspiration and passion required to research, discover and write the Scripture’s sustainable, eternal TRUTH—truth that even this morning, in the crunch, I was able to text to someone and calm them down within minutes concerning their anxiety, and this was not the first time this week, I have pounded another human mind with God’s truth in order to give them peace. To me…that is amazing. No doubt, the Spirit of God rewarded Dr. Luke’s diligence. Thought perhaps not inspired in the same way, my prayer is that the Spirit will reward my diligence with respect to not only Sustainable Love, but all the Sustainable topics to follow, including joy, peace, purpose, truth, community and influence. 2) That Spiritual faithfulness’ reward–such as Zacharias and Elizabeth’s with the conception and birth of their son who would become one of God’s greatest prophets–is often delayed, comparative to our standards or time, is no less real and lasting; 3) Spiritually born of God for a purpose, are John the Baptist. John the Baptist foreshadows every Christian’s conception, birth, growth and ministry. Every Christian, conceived within the mind of God is reborn in Christ and graced with God’s Spirit to prepare others to meet God, pure and simple. The goal in this second study now is to focus on Mary’s humble reaction and response to the incredible news that of all the people on the planet, by the Holy Spirit of God, she will conceive and bear, not just a great prophet who will prepare God’s people to receive their Messiah and Deliverer, as was the case with her cousin Elizabeth’s conception of and giving birth to John the Baptist, but, in this case, the real McCoy, the world’s Savior (“Christ” in Greek… “Messiah” in Hebrew) from sin and evil. 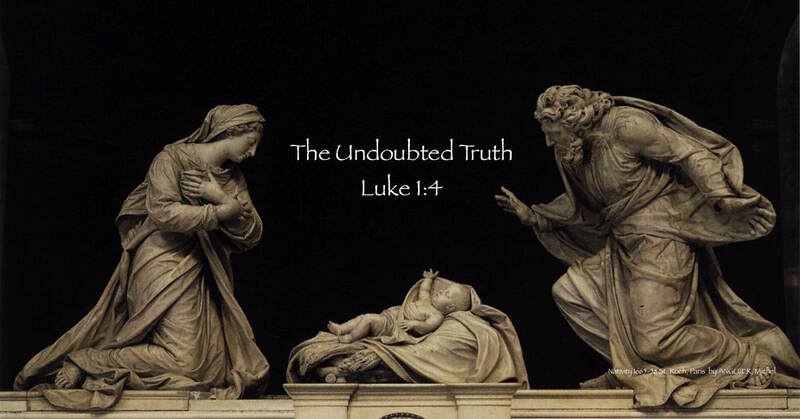 Teachers…This lesson for me over the past 17 years is about the incredible, required, divine and available grace to parent…or Spiritually nurture…not just any child, but the child of God…the Savior of the world. And yet, not unlike Mary, we too require this same grace to love, nurture and parent our children as well. Nothing has changed! Parenting still remains a daunting task that can only be accomplished with the help of God’s Spirit. • How did she become pregnant? • How big a town is Nazareth? A burg? Large city? • Where is Galilee? • What is Galilee? I thought Galilee was sea? • Why did God send Gabriel specifically? Was Gabriel also the angel God sent to Joseph in a dream (in Matthew 1)? v. 27 to a virgin pledged to be married to a man named Joseph, a descendant of David. The virgin’s name was Mary. What’s a virgin? A young girl? • How old was the girl? 12? 13? • Who is Joseph? • How old was Joseph?• He comes from the family line of King David? • How does one know that someone a thousand years later that they are from the line of a king? • How long were they been pledged for? Is this like engagement? Or had this been arranged by their families? Had Joseph, according to Middle Eastern marriage customs, entered into a covenant to take Mary as his wife after he had finished preparations to receive his bride? And being a carpenter, was he building an addition to his father’s house for Mary and him to live in? • Did Joseph and Mary love each other, like we think of love today? • Did they fall in love with each other? • When were they going to get married? Did the angel just show up or appear out of nowhere? • Was Mary startled or afraid? • Why has was she chosen to receive God’s favor? Had she done something special? Was she a good person? Did she especially love God? Or was this solely by grace? Or some combination? v. 29 Mary was greatly troubled at his words and wondered what kind of greeting this might be. How upset was she? Did she cry or scream? Was she silent in her fear? • Why did the angel’s words trouble her? What does it mean that she wondered what kind of greeting this could be? • If an angel appeared to me, I would be frightened out of my wits. v. 30 But the angel said to her, “Do not be afraid, Mary, you have found favor with God. The angel could sense Mary was afraid and sought to comfort her. • By re-emphasizing to her that God is pleased with her, does this imply that she has done something or has lived her life in such a way as to have pleased God? • Perhaps, the angel is saying, you are not in trouble, don’t be afraid (like being called to the principal’s office and fearing being in trouble for something that happened during recess. You are not in trouble; instead you are being praised for something). v. 31 You will be with child and give birth to a son, and you are to give him the name Jesus. Pregnant–you mean, like having a baby? You have got to be kidding? But I have not had sexual relations? I have not consummated my marriage vows with Joseph yet? • Why must we name him Jesus? * Does Jesus mean something special? Yahweh Saves? I AM Delivers? Why this name and meaning? Is God about to deliver or save his people and from what? How will he be great? Will he be a ruler? A king? The messianic ruler or savior of the world? • Who will call him Son of the Most High God? • How will he be the Son of the Most High? Is he really God’s Son? How can he be God’s son, if he is Mary’s son? • How is it that God will make him a king? • Are you saying that he is a direct descendent of King David? That David was his great-great-great etc. grandfather, and that is the way David is his father? Forever? Is that truly forever or just a real long time? • Who is Jacob? Israel? Wasn’t Jacob’s name changed to Israel after he wrestled with God through the night in Gen. 32 at the River Jabbok? Are you saying that his people—the people he rules over–all came from Jacob’s family? Now when John the Baptist’s father asked a similar question earlier, he was muzzled by God for quite some time, until his son’s birth. Will Mary be silenced too? It’s only fair? v. 35 The angel answered, “The Holy Spirit will come upon you, and the power of the Most High will overshadow you. So the holy one to be born will be called the Son of God. Who is this Holy Spirit? Can you see him? • God’s power will cover her? How? • Is this what will make her pregnant? • So somehow God’ power will cover her through this Holy Spirit and she will bear a child? And that is why he is called God’s son? • Will she feel all of this? Will it feel wonderful? • Will Mary get sick in the mornings and throw up? What does “holy” mean? v. 36 Even Elizabeth your relative is going to have a child in her old age, and she who was said to be barren is in her sixth month. She is related to Elizabeth? You mean God is making them both pregnant? Why? What is going on here? • How old was Elizabeth? 80? So this is all an answer to Mary’s above question? If I can do it with an old Elizabeth, I can do it with you–even though you are a virgin, because nothing is impossible with God. You mean God can do anything, including make old women and young virgins have babies? Yep! v. 38 “I am the Lord’s servant,” Mary answered. “May it be to me as you have said.” Then the angel left her. Why does she say, “I am the Lord’s servant”? Does this mean she is accepting what is about to happen to her? In other words, is she submitting to God’s divine will? Ask Who, What and Where? (Substructure–how does the Angel comfort her? besides it has already happened with your relative Elizabeth who is an old woman and everyone said it could not happen–therefore it can happen for you. vv. 35-37. • Mary, God’s Servant, Embraces Her Crucial Calling. 38. • The Angel tells Mary she will have a special child–God’s and David’s Son, and he will rule forever. • He will do this through the power of his Holy Spirit since she has not been sexually intimate with her soon-to-be husband yet, since she is not married yet. • Mary graciously accepts God’s call upon her life and body. Or restated: A young godly virgin accepts the seemingly impossible role of bearing the Son of God. What do I learn about God? Myself? Others? Life? 1) Angels exist; angels serve God; they are his messengers; they have names. 2) God knows and follows what we are doing within our lives and is pleased with our obedience–as in the case with Mary. 3) God knows the future and has a plan–as announced by Gabriel to Mary. 4) God desires to comfort the innocent’s fears. 5) Jesus was the Son of God, born to a virgin (not having had sexual relations) and a descendent of David. God empowers him and “…will make him great.” (Someday) He will rule forever a kingdom that has no end. 6) God manifests his power, or what seems humanly impossible, through his Holy Spirit–the third person of the Godhead who is unseen, but whose works are not. 7) Nothing is impossible–physically–with God. He controls the universe. He created it. 8) While Mary might have questioned how it was possible that she could become pregnant since she had not had sexual relations with a man, she graciously accepted what was about to happen to her as God’s faithful servant. Can you imagine what people will think when the baby begins to show (or perhaps she didn’t show much. Some women don’t much, but it’s doubtful). Will her parents, friends, and relatives believe her and Joseph that this child was conceived by God’s Spirit and is holy–sacred, set apart for God’s use in a special way…belonging to God…not common or profane? How does all this apply to me? I have much to be thankful for. I am alive. Yay! I am alive with my bride of 36 glorious years. Yay! Her skin cancer surgery was successful today! Yay! And we had a wonderful day, afternoon and evening together. We were like kids again, but in a good way. But even that growth and the ability to be like childhood friends together has come over a long time and great, but rewarding price. Thank you, God. And our kids? They continue to mature into wonderful adults and supportive friends. We are blessed. In addition, everyday, it seems that God gives us more and more kids…many young adults or millennials that are naturally getting their tails kicked by life, as they should. and as we did. These millennials are desperately needing Spiritual parents to guide and parent them through these tough times and many previously unwise and costly decisions. And I love it! All the many lessons that I have had to learn and learn in the parenting of my own kids are coming into priceless fruition. Thank you, God. Thank you for so so many life lessons learned. Thank you for teaching me the power of patient waiting over the years…that pain prepares willing students to learn. So wait for the pain. Wait for the moment. Then, with the Spirit’s delicate touch and leadership, pounce! Seize the day! Seize the teachable moments and opportunities! They will come. They always do. Childhood stubbornness and foolishly naivete are quickly exposed. Be patient. The moment will come. Be ready. Be sensitive, but be ready. O God, reclaim your children from sick and adulterous generation and culture. Reclaim them, clean them, teach them and empower them, just as you reclaimed, cleaned and empowered me. Teach them the same painful parenting lessons you called, exposed and taught our Lord’s mother two thousand years ago. The same lessons that you exposed me and Rhonda to over the last four decades. That because true Spiritual parenting is about process over time and NOT the momentary, pseudo-change that I seek to impose on my child in the moment, I…we can only do it with and by the merciful, miraculous and forgiving grace or favor of God. Amen. What about you? What is the most difficult thing you are going through at the moment? How can one of these truths relate?